We’re likely all familiar with the saying “don’t bring your work home” and the opposite remark, “leave your personal problems at the door when you come to work.” These phrases, or some facsimile of them, assume that we can compartmentalize our lives and only live one “role” at a time. What are the roles we play? They vary from person to person, but consider these for starters: husband, wife, partner, mother, father, sister, brother, child…those are pretty easy. What about these: pet owner, neighbor, volunteer, friend, caretaker and more. Last but not least, those roles we play at work: employee (veterinary technician, front office team member, etc. ), supervisor, manager, owner, veterinarian, best at putting in catheters, best at dealing with difficult clients, good with grieving clients, and sometimes, the owner’s wife, husband, child, nephew, etc. Is it fair to think we can slip into just one of those roles when doing a specific task? Hardly. We are an accumulation of all our experiences, past and present, and how we react to life is determined by this shaping. There may have been a time when someone at work was only that employee for the day, but I think in the past maybe employees had an easier time compartmentalizing their lives, and bosses got away with only handling the “employee part” of that person. It’s different now; management is all about relationships and letting the employee know that you care about each of those roles they hold in their lives. Each role affects them as an employee and their performances on the job. Just think, marriage issues, children problems, caring for elderly parents, the loss of a personal pet, all of these roles spill over into the person we are at work. It’s crazy to think they don’t. We’re in an era, and may always be moving forward, when we have to bring our whole selves to work and learn how to get the best out of each of those roles while at work. 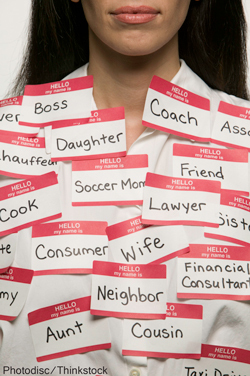 As managers or leaders, we must understand that we are dealing with a complex, multifaceted people (our employees) who have much more on their plates then just what is spelled out in their job descriptions. Our role becomes one of nurturing those roles that lead to good performance and job satisfaction for each individual. In order to do that, we have to learn about the roles each person must play in their lives. Each step of the way, with each “mask” that we find our employee wearing, we get closer to being a better leader, and employee.